Nicholas Pope's mission is to have a positive impact on people. Professionally, he has chosen to help clients and their families plan for and maintain a financial sense of confidence by implementing strategies designed to preserve the wealth clients have created and helping to build a legacy for future generations. Nicholas is a member of the Financial Planning Association and he currently holds the Certified Financial Planner™ (CFP®) professional designation. Personally, Nick works toward the achievement of his mission by volunteering his time and expertise to various organizations. 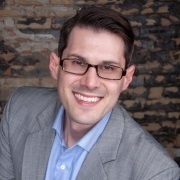 He currently serves on Todd Martin Youth Leadership board of directors, East Lansing Film Festival board of directors, volunteers for Kids Food Basket of West Michigan and supports the Cedar Springs Education Foundation. Nicholas resides in East Grand Rapids, MI with his wife Angie, and daughters Iva and Mabel.